2018 is shaping up to be the year that Hannah reads A TON of feminist novels. Fifth book of the year, the second review I’ve written, and second feminist novel of the year. And I am not complaining. I’m here for it. Bring me all of the feminist novels in 2018. And I mean ALL. OF. THEM. Just like the last book I reviewed, The Power by Naomi Alderman, this book is being likened to Margaret Atwood’s, The Handmaid’s Tale. Set in a small fishing town in Oregon the story follows, four woman (technically five but we’ll get there) as they deal with the repercussions of new legislature that changes each of their lives as they deal with freedom and what that means for each of them. Ro, a high school teacher struggles with her fertility. Susan, a frustrated mother of two trapped in a failing marriage. Mattie, an adopted teenager who finds herself experiencing an unplanned pregnancy. Gin, an herbalist who is arrested and put at the center of a modern-day witch hunt. This book is set in the not so distant future in Oregon after Roe vs. Wade is over turned and new legislature is passed. The Personhood Amendment. This amendment gave the constitutional right to life, liberty and property to a fertilized egg at the moment of conception. This effectively makes abortion a murder charge (there is even a “pink wall” at the Canadian border that prevents woman seeking abortions from leaving the country) and it causes in-vitro fertilization to be banned, due to the fact that embryos “can’t give their consent to be moved.” All of the woman in this story are effected in some way or other by this new law, and the story focuses on what it means to each of their lives, freedom, and identities. One of my favorite things about this novel is that Leni Zumas used real life legislature put forth by many men in Congress and our government when it comes to Women’s Rights and the right to choose what happens to our own body’s as woman. This book gave a very vivid picture of what this world could be like if Roe Vs. Wade is overturned and some of the men in government roles get what they want in regards to women’s bodies. And while this book is definitely a feminist novel, a novel that makes it clear that a world in which Roe vs. Wade being over turned, and abortion and in-vitro fertilization being illegal is not a great one, I don’t think someone who believes in pro-life arguments would feel like they were being attacked, or offended. Although I say that and everyone is offended by something. I think where this book succeeds is it really sticks to just the experience of the women in the story and lets you see what they are having to go through once these laws are passed. I was really looking forward to reading this book the minute I read a synopsis, I even signed up for Book of the Month Club just so I could get it before it actually came out. While I wasn’t disappointed and while I did really enjoy it, I think I may have overhyped it to myself. I was really expecting to be blown away and I just wasn’t. I wanted to be able to give it 5 stars but I just couldn’t do it. So for me it gets 4. With that said though – I would HIGHLY recommend this book to everyone. 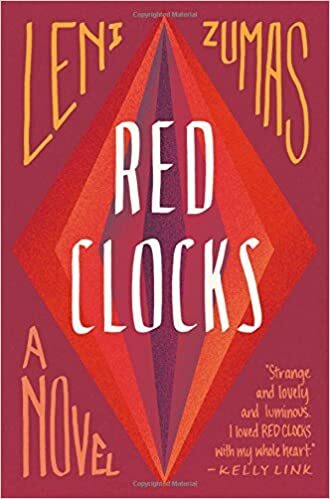 Let me know what you thought of Red Clocks or give me some recommendations of your favorite feminist books!